New American Soldier contemplates two of the most debated issues in US politics today: immigration and the wars in Iraq and Afghanistan. Through the stories of real people on the front lines, this powerful documentary gives us a better understanding of the people who are fighting this war, and what it means to be American. 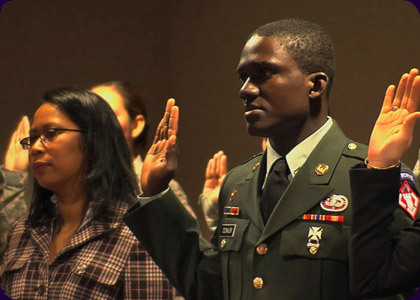 The film follows three immigrant soldiers through the ups and downs of training and deployment as they take steps towards achieving US citizenship. Seth Donker won the visa lottery and left his homeland of Ghana two years ago. A soft-spoken young man, he is now living out his Rambo daydreams as a Private in the US Army. Clarissa Calderon and her family emigrated from Peru when she was a girl. She never thought of enlisting until a recruiter told her that the Army would pay for medical school. Victor Toledo Pulido and his family walked across the US/Mexico border when he was seven. The Army offered a way out of the farmlands of California's Central Valley, but Toleda Pulido was killed in Iraq a year and a half after enlisting. Emma Cott is a documentary producer and cinematographer living in the Bay Area. She has worked on documentaries for PBS and NBC News, and reported in Latin America and Asia. She is a recent graduate of the UC Berkeley Graduate School of Journalism's documentary program. Anna Belle Peevey is a NYC-based documentary filmmaker, and a recent graduate of UC Berkeley Graduate School of Journalism. She's worked as a print reporter, radio producer and television anchor. She's produced stories for Al-Jazeera English and PBS, and her work has taken her everywhere from the tobacco fields of southern Virginia to the cotton fields of southern India.